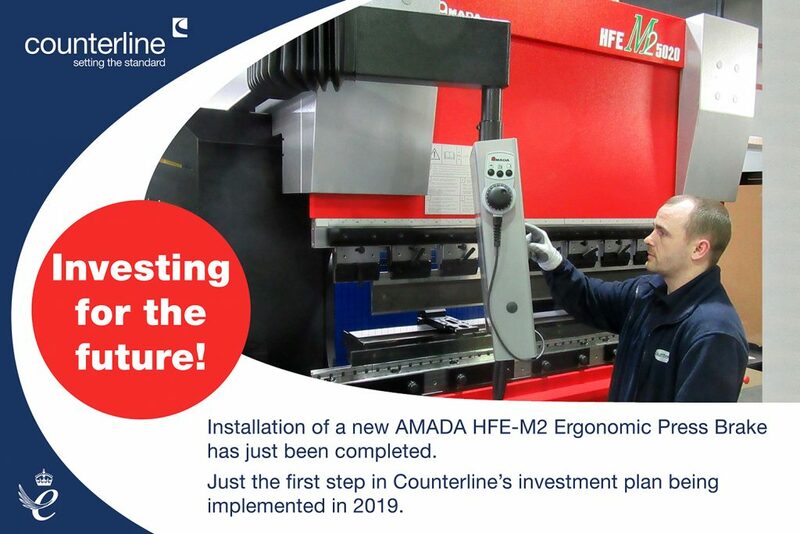 Counterline have just completed the installation of a new state of the art ergonomic press brake, the AMADA HFE-M2. This intends to improve efficiency as well as accuracy in our manufacturing process. The new ergonomic range builds on the success of the HFE series and focusing on the working environment, adding features that support the operator’s activity. The operator is at the heart of the 5012 model concept. Ergonomic solutions are designed to make the bend process comfortable and fast. The solution, offers the operator all the comfort, space and tools to be highly productive throughout the day. Thanks to the high performance of upper beam and the AMADA patented FAST finger (Finger with Active Safety Technology), the HFE-5012M2 is a highly productive solution for small part processing. With more than 125,000 press brakes and 1,500 bending cells installed AMADA are at the forefront of press brake innovation and product development. The patented lower beam design and large working envelope of the HFE give the user great flexibility whilst a newly designed control panel and energy saving drive improve efficiency and profitability. If you require the installation of a serving line, or a catering or display counter, contact us today to find out what we can do for you. Counterline has received M0 (-1°C to 4°C) classification!